Terminal Time is a collaboration between computer scientist Michael Mateas, video producer Steffi Domike, and electronic artist Paul Vanouse. Terminal Time is a history engine which generates believable historical documentaries in response to audience polls. 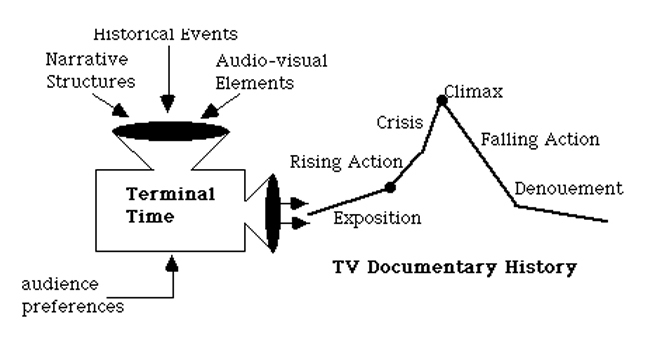 A case-based story system constructs ideologically biased historical documentaries by combining historical episodes and plot templates stored in a case memory. At several points in the story, the audience is presented with a set of multiple-choice questions which are answered via an applause meter. These answers influence the story engine in the choices it makes. The resulting constructed history creates the illusion that history has been about some single theme or small set of interlocked themes. As an art project, Terminal Time critiques positivist history, notions of interactive freedom (utopian navigation), and the rhetorical framing of documentary films. As an AI project, Terminal Time explores case-based story generation, broad and shallow knowledge representations for history, and ideological reasoning. Terminal Time is a work in progress. In this talk I’ll describe the current design, show a performance of a prototype, and describe current and future work on the project. Terminal Time was supported by the Pennsylvania Council on the Arts, the Pennsylvania Humanities Council, The Pittsburgh Foundation, and the Heinz Endowments.